More service does tend to bring more ridership. Well, it likely depends on how the 2018 budget treats Amtrak. If the current administration gets its way, then the chance is zero. If the funding stands as is, then the chance is likely still zero. 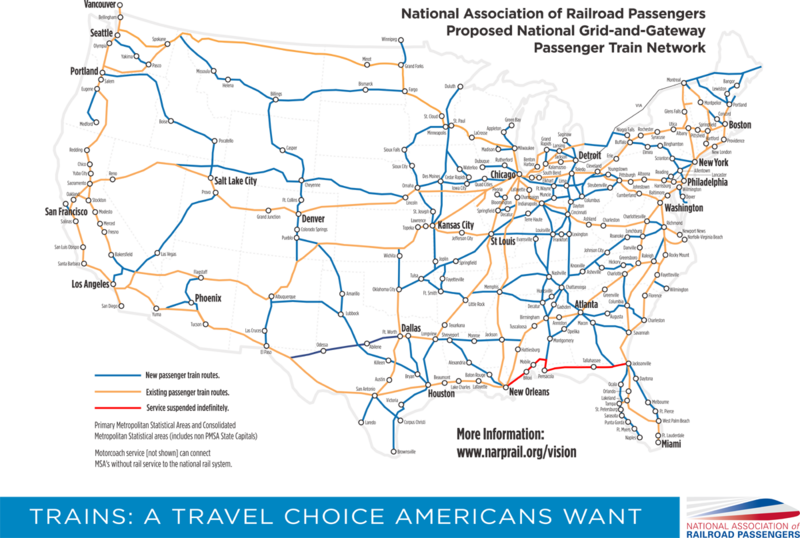 The only way we'd get more service is if Amtrak, either through the feds or state, received more money. Any additional lines would likely require something like the MMPT to facilitate, because the current station is rather limited in which direction trains can run from there. Same goes for the proposed Doraville station. Of course, any regional intercity rail and important commuter rail stations in the metro and along these routes should receive Amtrak service. More stations don't get us more track, do they? I don't know, I have no idea how Amtrak works. I've always wanted to take the Crescent line to New Orleans. I thought it sounded like fun. But I read about it, and the consensus seems to be that riding Amtrak is about exactly like riding a Greyhound bus at the same cost as buying an airline ticket. What are the chances of the ATL getting more Amtrak service? Not real great for Atlanta, or any other city for that matter. According to the interactive graphic in the OP, we do have a lot more riders than we did 20 years ago. Plus we have a lot more Amtrak riders than many other cities. So on a comparative basis we're not exactly chopped liver. Anything related to infrastructure that isn't roads or walls is chopped liver for the next several years. I wish train tickets weren't so expensive and the travel time so long. No. Our one Amtrak station [on Peachtree adjacent to I-85, if you weren't sure] is served only by the Crescent Line. The next nearest station is Gainesville. If you look at station locations for places that have, apparently, more than one station, its actually one station in the city, itself, and other stations in satellite cities. For instance, mousing over the dot representing Charlotte says they have 3 stations. Its actually one station in Charlotte, one in Gastonia, and one in Concord, all served by the same line. If its a matter of adding a second Amtrak station to the metro ATL region, where [presumably along its current route] should it be added? Buford is one possibility. Duluth is an even better one. Its not dissimilar from riding a bus. Nowhere near as cramped, though. You can get up and walk around, and even grab a bite to eat. Still, its an 11-hour ride from ATL to NOLA. If the market potential is there, privatize. Creating and implementing an efficient and customer-driven rail system would take such an enormous capital investment that I can't see the government taking this on in the foreseeable future. Just the cost of establishing dedicated track lines(until this is done, it will be impossible for Amtrak to maintain dependable schedules) would be prohibitive. After years of enjoying the marvelous passenger train service in Europe, and jaded from more years of enduring the increasingly burdensome dystopia of air travel, my DH and I decided to give Amtrak a whirl on our next trip to New Orleans. I was notified ten days before departure that my reservations had been cancelled due to 'track issues'. Our only option was to rent a car, as we had booked a plane for our return trip. So there you go, two potential longtime customers gone in a flash. The best case scenario would be to find a consortium of billionaires that could see the potential here and run with it. Honestly, I would use a Brunswick>Savannah>Atlanta train frequently, especially as I grow older and less patient with road travel. If it was good enough for my grandmother, it's good enough for me.